ESSO EXPRESS PAY – PHISHING. 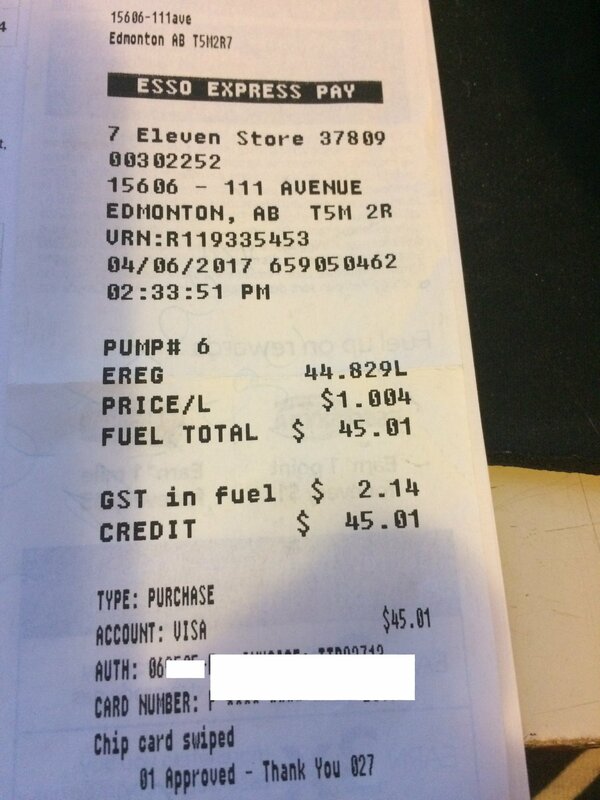 Address: 15606 111 Avenue, Edmonton, AB If you have used this gas station in the past weeks – check your receipt and check your credit card statements. Especially if you used the pump to pay. I went to the gas station yesterday and I put in $45.01 and used the pump to pay. The following day I decided to check my credit card statement. I suddenly remembered that the pump didn’t ask me for my pin number and thought that was odd. Imagine my shock and anger when I saw my credit card was charged $150.00! It could have been so much worse…but I always keep a low limit on credit cards…for this very reason! I have notified the police and the gas station (his manager isn’t there). I was given the Manger’s phone number and will call him at home tomorrow to let him know there is a problem. THIS is why I think pay at the pump needs to end. How many innocent people are being stolen from and aren’t aware of it? How many people actually print and keep a receipt? Please – notify anyone you know and get them to check! It’s an extremely busy gas station and I can’t imagine how much money is being stolen from innocent victims! I can’t blame the gas station – it’s on their property but ANYONE can tamper with the payment machines. They need to be blocked and removed. I am laughing. I know the manager of this location and he is an honest respectable man. When you tap your card it pre-authorizes a specific amount. $150 is that amount. If you only used $45.01 then what happens is once the charge is posted to your credit card account the remaining authorization returns to your credit limit. If you look at your credit card statement you will notice at times that your credit limit minus your available balance don’t equal your current charges, this is due to preauthorizations. If you don’t understand how using a credit card and pre-authorizations work then please don’t speak out against a business for their practices. Your ignorance will cost them customers and create an unfair image of their business. That’s called pre-authorization, and its not just gas stations that do this. This is why you always manually set your own amount. The $150 is preauthorization charge. You will see it credited, and correct amount debited from your account in the next few days. This isn’t unusual. Yeah this is precisely why I go in and pay. Years ago in Calgary, this happened to me at an ESSO. They skimmed my card and went on a shopping spree racking up over $700 in unauthorized charges. I eventually got my money back but it was a hassle. Thanks for the heads up. I’m pretty sure when we used to pay at the pump it would auto-charge $100 in gas and in a few days the correct amount was showing. That isn’t Phishing… personally I always pay with cash. I was double charged at a gas station, I only ended up using less than half of what I preapproved for and it double charged me. My bank had it reversed before they reopened from the weekend thankfully! It’s definitely something to be aware of! I’m pretty sure the $150 is a pre authorization on the card. It’s hard for the bank to tell if it’s a pre authorization or a charge at first, remember you’re talking to a customer service rep who can only see so much, wait a few days and hopefully the difference will be released back on! Unless the person selected “fill” why would that amount be pre authorized? Because they probably hit the button that says ” authorize up to $150″. It automatically charges $150 then adjusts the amount to the actual amount used. Costco does this all the time too. I thought this had happened to me some time ago-but a different gas station. The gas station I normally use preauthorizes a higher amount but when it is posted to my credit card statement it’s for the correct amount. It sometimes takes a couple of days before it’s posted as an actual charge with the correct amount and not just a preauthorized one at a higher amount. Hope this is what happened to you. If not, thanks for the warning! But it’s because all the low lifes that gas n’ go that they instituted this in more pumps than before. Usually you can prepay inside. Do that if the card thing is a concern. Preauthorized. It does that to make sure your card will cover the purchase amount. after it has cleared. it credits you back the difference. You will have the amount changed in a few days. You authorized up to $150. They do that to make sure there is enough on the card to pay for your gas. After a few days they change it to the actual amount you used. All gas stations do this if you prepay with you credit card/bank card. Never had that happen with my bank card. I’ve never had that happen to me and I pay at the pump all the time. I have only used my bank card and it does it all the time. I’ve had this happen to me for 250 and it took my credit card company over 2 weeks to return my money.. I use pre-auth all the time. I can go in and look at my bank info immediately after the transaction is complete, and it’s never taken the full amount out of my account and reimbursed me the difference later. It’s only ever taken the actual amount pumped. The pre-auth is a temporary hold….until the transaction is complete by hanging up the nozzle, not days. I’ve never, ever seen that happen. Hotels, yes, gas stations, no. At least not in my experience. What everyone says about the pre authorization is correct. I understand you are you are upset. Stores actually have a couple days to adjust your amount. Call your credit card company. They will tell you the correct information regarding your charge. Number being given out by my employee That is breach of personal privacy in the workplace. A company should never allow their employees to give out personal numbers. I never allow my employees give mine or any other member of our staff numbers out. That is for safety reasons. They should have taken your number and had the manager contact you. We don’t deal with business and customers on our personal phone. We deal with business at the business. This is a pre-authorization and then the correct amount will show up in a few days. Sometimes pre-authorization can take 3 to 5 days before it comes off. Pre authorizations are actually quite common. If you check into a hotel, they normally do a pre-authorization for the room charge plus some (in case of damages). If you have booked through expedia or have pre-paid the room amount, they will do one for $100 in case of damages. Just wait a few days and it will be ‘dropped off’ your statement because it is not the same as a purchase. If you purchase your gas at Domo, Monday and Thursday is 5 cents a litre off and it’s cash or debit machine. And I would suggest posting this on the ESSO Canada f/b page. You will get their attention. Except that it was a pre authorization. You agreed to a pre paid amount of maximum $150. The actual charge will show on your statement within a few days. Next time select $50. In BC you have to pre-pay all the time everywhere. Go in and pay then. I don’t trust the pumps for that reason. Here in BC you have to pay first to get gas. Call your credit card company, they’ll probably tell you it was a pre authorization, and it will reflect the accurate charge in a day or so. When you get your money back from this preauthorized transaction, you need to post a retraction and apology. This all a misunderstanding caused by you being unaware of how things work in the real world. Jessica Pettican this is by you! This happens at all gas stations :/ you can pre authorize a certain amount, I usually do $40 because a fill for me is never more than that. But I’ve seen up to $150. It’ll only charge what you actually used, check your credit card in a few business days and you’ll see. i mentioned to them that their “void” sticker was showing void. It said it the word void appears let attendant know. They just took them all off and didn’t do anything about it. It’s a pre auth and will return the rest in a few days. I never pre auth for this reason. Only what I’m putting in. Same pre auth you consent to when you stay in a hotel. It’s not a phishing scam… I was the manager at the Esso by my house a few years ago and when you use your credit card at the pump to prepay, it will automatically hold $150 as a pre-authorization unless you select a specific amount. If this lady would just check her statement again, she would see she was only charged the $45.01. I know this for a fact because I had to deal with a lot of customer complaints about this exact scenario. Gas station pumps can preauthorize $75-150 it will fall off your credit card statement thats why I never pay at pump. Yes, this is what I do as well. Change the amount. Petrol Canada has a $200 pre-auth amount which is crazy! I didn’t know that, how do you change your preauthorization amount? You called EPS over a prepaid authorization? It will correct in a few days, all gas stations do this. Same as a hotel or car rental deposit.